While low levels of the protein ubiquilin-4 (UBQLN4) are linked to increased sensitivity to genotoxic stress and delayed DNA double-strand break repair, elevated levels of this DNA repair-associated protein have been found in particularly aggressive tumors. Genomic instability can be a hallmark of both human genetic disease and cancer. Throughout the cell cycle DNA is monitored for damage. Damages result from errors during replication, by-products of metabolism, general toxic drugs, or ionizing radiation. The cell cycle has different DNA damage checkpoints, which inhibit the next or maintain the current cell cycle step. There are two main checkpoints, the G1/S and the G2/M, during the cell cycle, which preserve correct progression. 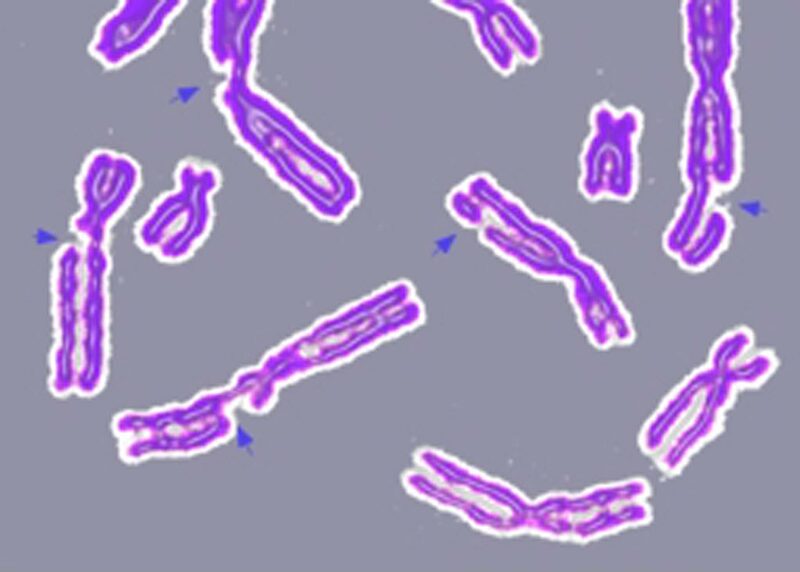 Image: An example of DNA damage causing multiple broken chromosomes (Photo courtesy of Wikimedia Commons). Investigators at Tel Aviv University (Israel) and their collaborators in Germany and the United States identified a deleterious UBQLN4 mutation in families with an autosomal recessive syndrome reminiscent of genome instability disorders. UBQLN4 plays a role in the regulation of protein degradation via the ubiquitin-proteasome system. It mediates the proteasomal targeting of misfolded or accumulated proteins for degradation by binding to their polyubiquitin chains and by interacting with the subunits of the proteasome. As part of an ongoing study on the role of UBQLN4, the investigators reported in the January 3, 2019, online edition of the journal Cell that UBQLN4 deficiency led to increased sensitivity to genotoxic stress and delayed DNA double-strand break (DSB) repair. UBQLN4 was phosphorylated by ATM (Ataxia-telangiectasia mutated) and interacted with ubiquitylated MRE11 (MRE11 homolog, double strand break repair nuclease) to mediate early steps of homologous recombination-mediated DSB repair (HRR). Loss of UBQLN4 led to chromatin retention of MRE11, which promoted non-physiological HRR activity in vitro and in vivo. On the other hand, UBQLN4, which was found to be overexpressed in some aggressive tumors, repressed HRR and favored non-homologous end joining. In line with an HRR defect in these tumors, UBQLN4 overexpression was associated with PARP1 inhibitor sensitivity. PARP1 (Poly [ADP-ribose] polymerase 1) is a protein that is important for repairing single-strand DNA breaks. If such nicks persist unrepaired until DNA is replicated (which must precede cell division), then the replication itself can cause double strand breaks to form. Drugs that inhibit PARP1 cause multiple double strand breaks to form in this way, and in tumors with BRCA1, BRCA2, or PALB2 mutations, these double strand breaks cannot be efficiently repaired, leading to the death of the cells. 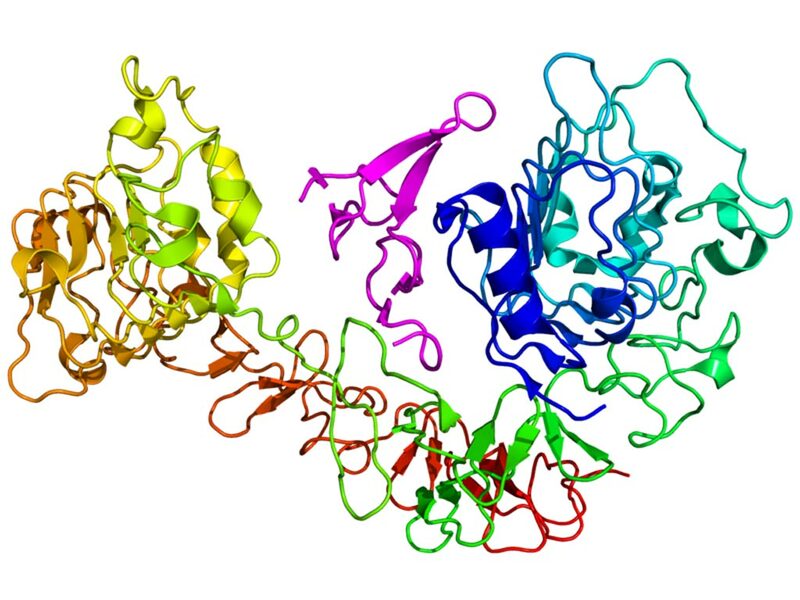 Normal cells that do not replicate their DNA as often as cancer cells, and that lack any mutated BRCA1 or BRCA2 still have homologous repair operating, which allows them to survive the inhibition of PARP1. Since UBQLN4 curtails HRR activity through removal of MRE11 from damaged chromatin, it offers a therapeutic window for PARP1 inhibitor treatment in UBQLN4-overexpressing tumors. "This novel biomarker provides new, critical information about the tumor stage and grade, as well as the patient's chances of responding to treatment," said senior author Dr. Yosef Shiloh, professor of human genetics at Tel Aviv University. "Tumors with high levels of ubiquilin-4 may be more resistant to radiation and some types of chemotherapy than those with normal levels of this protein. But the good news is that they may also respond better to other types of cancer therapy. Obviously, this is vital information for clinicians and patients. The importance of maintaining genome stability and integrity has been demonstrated through the study of rare genetic disorders, but genome stability has now become a public health issue. There are so many proteins involved in responding to DNA damage, and behind every protein is a different gene. There are infinite ways in which a gene can mutate. Various combinations of these mutations may lead to chronic diseases and a predisposition to cancer, premature aging and other conditions. Genome stability is everyone's problem." "We hope our findings will provide a new tool for tumor classification, prognosis and treatment design," said Dr. Shiloh. "The research highlights the broader implications of the importance of genome stability for our health."